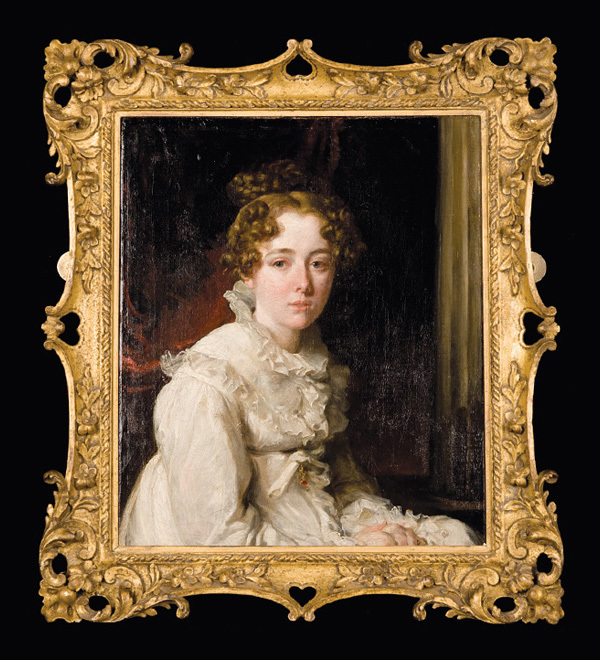 This oil on canvas, a portrait of the artist’s sister, Harriet Hilton was painted when she was sixteen, possibly at Motherby Hall, Lincoln. ‘Mine has been an unusually happy lot, to have been united by such close ties with two such men’. The picture was handed down by Mrs de Wint to her daughter, Mrs Tatlock, who left it to her daughter Miss HH Tatlock. It passed to her friend and companion Miss Bostock of Wychbury, Winchester from whom it was acquired by Geoffrey Harmsworth. William Hilton was the son of a portrait painter from Newark. He worked with his father before moving to London in 1800 to the studios of engraver and portrait painter John Raphael Smith. It was here that he met Peter de Wint. He attended the Royal Academy Schools in 1806 and it was in this year that he accompanied Peter de Wint on his fi rst visit to Lincoln. It was during this stay that de Wint met Hilton’s sister, Harriet. They were married in 1810, and the connection was to have considerable infl uence on de Wint’s career. Influenced by the grand manner of the Old Masters, Hilton was a keen painter of historical subjects, of classical myths, gods and heroes. His works are in the collections of the National Portrait Gallery, including portraits of John Clare (1820) and John Keats (1822) and The Tate Gallery including Cupid and Nymph (exhibited in 1828). Hilton became an Associate of Royal Academy in 1813, and Royal Academician in 1820, later becoming Keeper of The Royal Academy in 1927.